FAQ’s – Force Termite & Pest Control, Inc.
1. Is Force Termite & Pest Control Licensed? 2. Are your technicians licensed? ~ Yes, all technicians are licensed and kept abreast of the latest technology’s through re-certification and training. 3. Is Force a member of any industry affiliations or associations? ~ Force is a member of NJPCA, the New Jersey Pest Control Association, and NPCA, the National Pest Control Association. Force actively participates in all available educational seminars, conferences, and classes to keep our expertise at its peak and to stay abreast of changes and developments in our profession. 4. Do you charge for estimates? ~ Free of course, cheerfully given! ~ Force has a customer base of over 15,000 homes and businesses and can provide references in your area. 4. 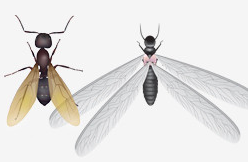 FLYING ANTS VS. TERMITES: How can I tell the difference between a flying ant and a termite? Ants have wings which that are not equal in length and sometimes end at the tip of their abdomen. Termites wings are equal in length and go well past the abdomen. Termites also shed their wings when they swarm, while ants retain their wings. The antennae shape is different. Ant antennae are more shaped like an elbow. Antennae on termites are straight and bead-like. ~ Waist Size Ants have a pinched waist. Termites do not, their body is are more streamlined. cbd oil for sale online vape . Watch free movies on 123movies https://www.123movies.gdn without registration.